Sales Merchandiser ensures that the product of the company reaches the shelves of the retail stores at the right time and in the right quantity. 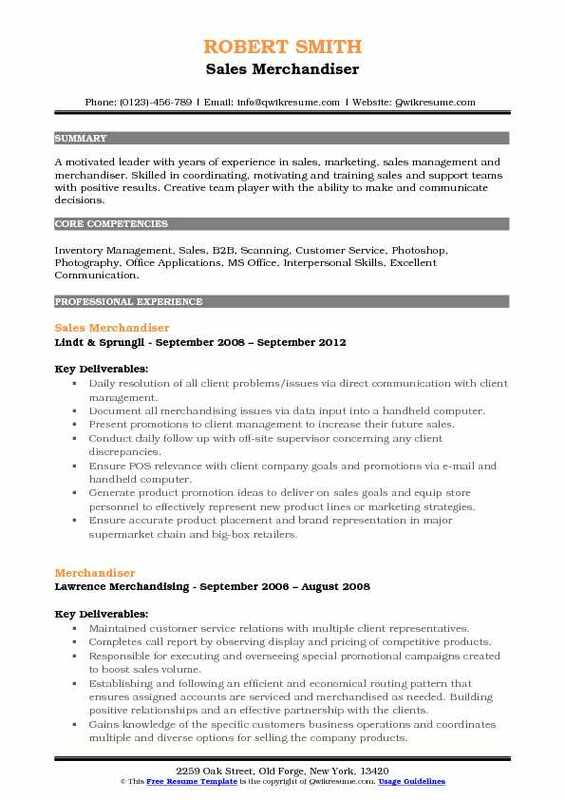 A well-refined Sales Merchandiser Resume mentions tasks such as studying customer trends, ensuring that the stock level is well maintained, creating displays, plan-o-gram executions, rotating products, employee training, maintaining good rapport with employees, overseeing marketing activities, maintaining in-store promotional materials, developing merchandising strategies, monitoring stock movement, updating records, predicting customer behavior and studying consumer trends. 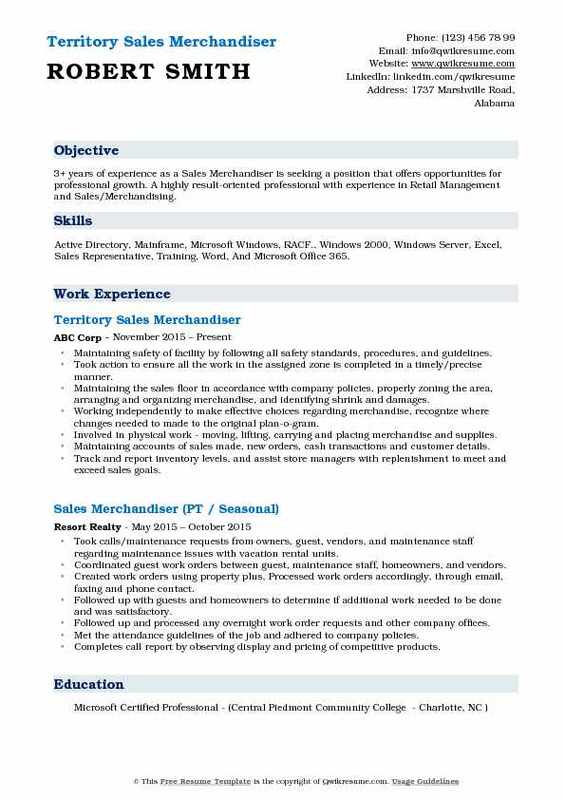 The Sales Merchandiser should mention throughout the resume skills such as commercial awareness, merchandising experience, up-to-date knowledge of merchandising trends, decision-making skills, supply chain management knowledge, and related physical abilities. A degree preferably in retail management is common among most of the sales merchandisers. 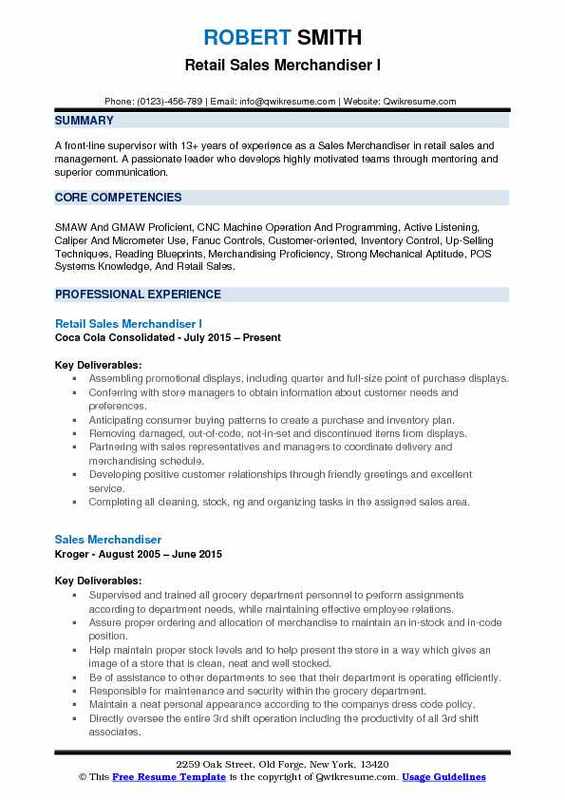 Summary : 11 years of experience as a Sales Merchandiser is now seeking a challenging position in a prominent organization where my experience and my education will be of value and assistance in achieving the company's goals while enabling me to pursue my personal growth. Skills : Microsoft Word, Microsoft Excel, Microsoft PowerPoint, Marsha, PMS, SFA, CI, Excellent Interpersonal Communication, Inventory Control, Customer Service, And Retail Management. Group sales merchandiser for 9 latin american markets: Argentina, Colombia, Chile, Costa Rica, Dominican Republic, Guatemala, Panama, Peru Venezuela. Ongoing reactive and proactive assistance related not only to the groups' segment but other tasks required for the development of the regions potential, increasing performance and success levels. Active participation when our stakeholders show an interest in visiting our offices, participate in key brainstorming sessions with the GSO and GSA associates relevant to the business and the markets we are accountable for. Fostering engagement with not only our customers but our team members, stakeholders, intermediary partners, sales executives, senior leaders, key corporate account clients and clientele in general. Virtual - webinars for Marriott representative offices in Latin America sharing appropriate training content focused on the mechanics of the groups and how to prospect and secure more group business opportunities and motivating a more refined qualification process each time a group lead comes across. Continuous reporting to showcase the segment status, key wins, trends, top destinations, challenges for closure, prospecting efforts. Some of those reports to be shared to senior leadership committees. Committed to activation of new clientele, in the Cala Non- GSA deployed markets such as Bolivia, Ecuador, El Salvador, Honduras, Paraguay, Puerto Rico, etc. Driving ultimate performance from GSAS for the groups' segment for the achievement of the regional goal and committed to increasing the "closure ratio" year over year by 15%. 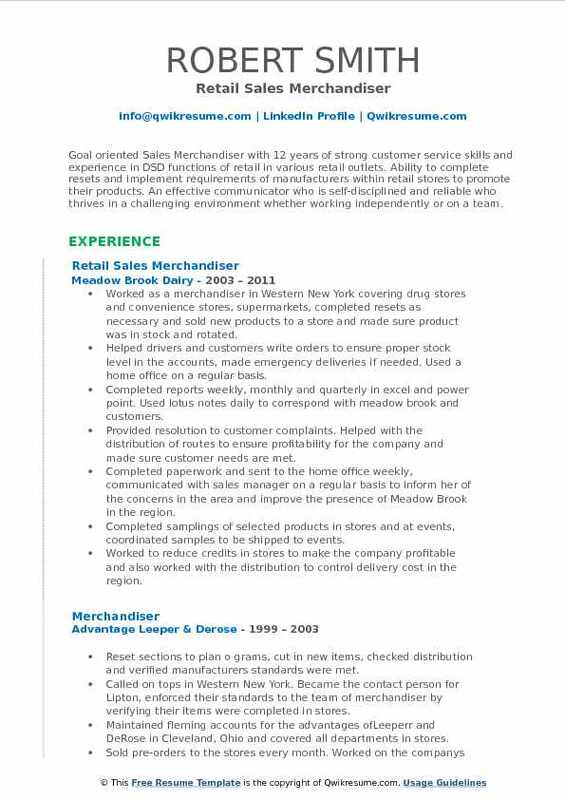 Summary : A front-line supervisor with 13+ years of experience as a Sales Merchandiser in retail sales and management. A passionate leader who develops highly motivated teams through mentoring and superior communication. Skills : SMAW And GMAW Proficient, CNC Machine Operation And Programming, Active Listening, Caliper And Micrometer Use, Fanuc Controls, Customer-oriented, Inventory Control, Up-Selling Techniques, Reading Blueprints, Merchandising Proficiency, Strong Mechanical Aptitude, POS Systems Knowledge, And Retail Sales. Assembling promotional displays, including quarter and full-size point of purchase displays. Conferring with store managers to obtain information about customer needs and preferences. Anticipating consumer buying patterns to create a purchase and inventory plan. Removing damaged, out-of-code, not-in-set and discontinued items from displays. Partnering with sales representatives and managers to coordinate delivery and merchandising schedule. Developing positive customer relationships through friendly greetings and excellent service. Completing all cleaning, stock, ng and organizing tasks in the assigned sales area. Responsible for distributing and merchandising the glazers brand portfolio within an assigned territory and working with retail partners to sell new brands, promotions, control inventory management and pricing strategies. 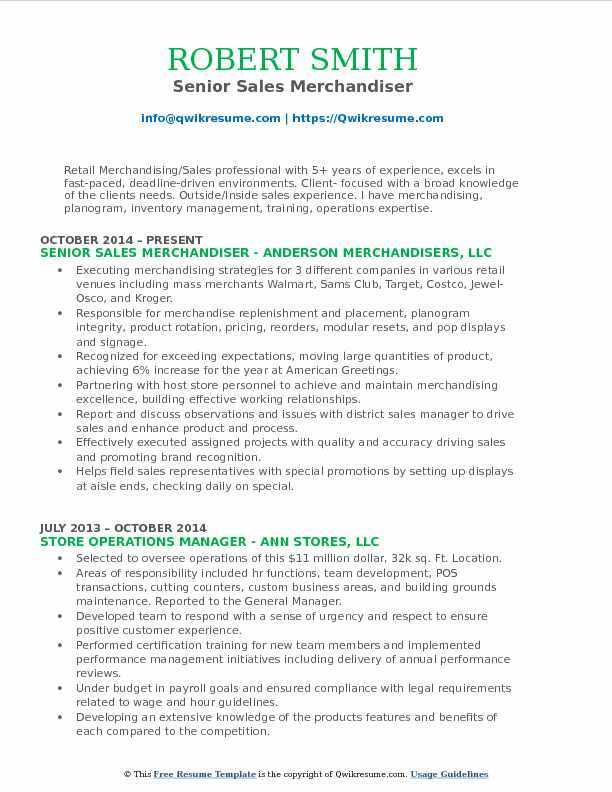 Objective : One year of experience as a Sales Merchandiser is looking to utilize my experience and knowledge of skills, to perform tenaciously to benefit my employer and myself. Skills : Customer Service, Logistics, Outside Sales, Retail Sales, MS Office, Quoting, Blueprint Reading, International Sales, Cold Calling And Business Development. Store reset support for natural food and specialty retailers as needed. Merchandising and retail support for accounts daily as directed by the sales manager. Maintained stores sets/testers/merchandising units/displays/product literature weekly and as warranted. Utilized market data (rankings, sales trends, etc.) to improve placement and retail support. Supported the team for trade shows and special events as necessary. Maintained inventory by restocking shelves with product from inventory and observing inventory level. Consulted, advised and engaged with retail partners on category management and business analytics to help improve the performance of their business. Summary : Goal oriented Sales Merchandiser with 12 years of strong customer service skills and experience in DSD functions of retail in various retail outlets. Ability to complete resets and implement requirements of manufacturers within retail stores to promote their products. An effective communicator who is self-disciplined and reliable who thrives in a challenging environment whether working independently or on a team. 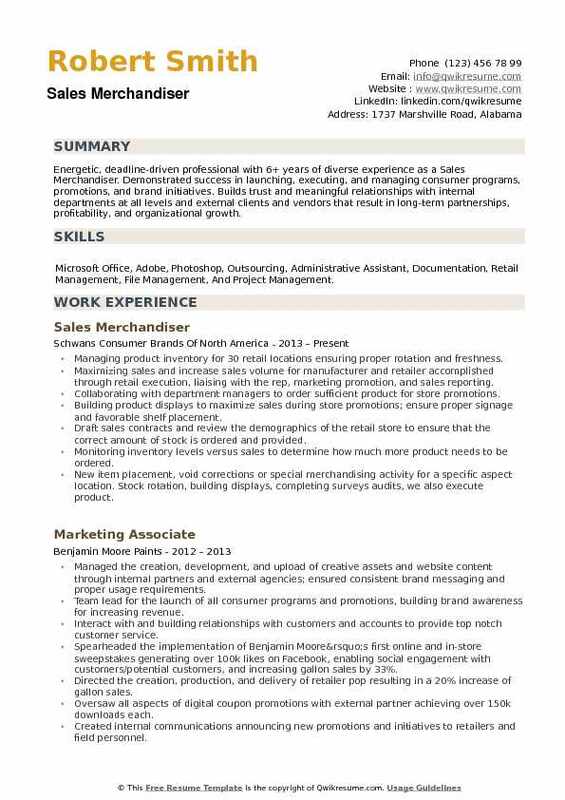 Skills : Graphics Designs, Computer, Office Machine Experience, Customer Service, Collections, Secretarial, Managerial, Sales, Merchandising, SAP, CRM, MS Office And Inventory Management. Worked as a merchandiser in Western New York covering drug stores and convenience stores, supermarkets, completed resets as necessary and sold new products to a store and made sure product was in stock and rotated. Helped drivers and customers write orders to ensure proper stock level in the accounts, made emergency deliveries if needed. Used a home office on a regular basis. Completed reports weekly, monthly and quarterly in excel and power point. Used lotus notes daily to correspond with meadow brook and customers. Provided resolution to customer complaints. Helped with the distribution of routes to ensure profitability for the company and made sure customer needs are met. Completed paperwork and sent to the home office weekly, communicated with sales manager on a regular basis to inform her of the concerns in the area and improve the presence of Meadow Brook in the region. Completed samplings of selected products in stores and at events, coordinated samples to be shipped to events. Worked to reduce credits in stores to make the company profitable and also worked with the distribution to control delivery cost in the region. Objective : 3+ years of experience as a Sales Merchandiser is looking to obtain an entry-level position in Retail Sales. I have merchandising, planogram, inventory management, training, operations expertise and much another learned business acumen. Skills : MS Office, Trend, Livelink, FileMaker Pro, CDEM, Epson GT-2000, Customer Service, Retail Sales, Peoplesoft, Merchandising, And Expense Control. Responsible for maximizing the sale of supplier brands to retail chain customers. Effectively manages fourteen accounts. Manages time and activities to ensure achievement of company and supplier established goals and sales objectives within assigned accounts. Developing monthly, weekly and daily written plans for execution. Establishing and following an efficient and economical routing pattern that ensures assigned accounts are serviced and merchandised as needed. Building positive relationships and an effective partnership with the clients. Gains knowledge of the specific customers business operations and coordinates multiple and diverse options for selling the company products. Developing an extensive knowledge of the product's features and benefits of each compared to the competition. Communicating issues, Opportunities, and market intelligence with appropriate management through written, electronic and verbal means. Maintaining up-to-date, accurate territory and account records. Submits prompt and accurate reports. Follows company policies and procedures. Objective : 3+ years of experience as a Sales Merchandiser is seeking a position that offers opportunities for professional growth. A highly result-oriented professional with experience in Retail Management and Sales/Merchandising. Skills : Active Directory, Mainframe, Microsoft Windows, RACF., Windows 2000, Windows Server, Excel, Sales Representative, Training, Word, And Microsoft Office 365. Maintaining safety of facility by following all safety standards, procedures, and guidelines. Took action to ensure all the work in the assigned zone is completed in a timely/precise manner. Maintaining the sales floor in accordance with company policies, properly zoning the area, arranging and organizing merchandise, and identifying shrink and damages. Working independently to make effective choices regarding merchandise, recognize where changes needed to made to the original plan-o-gram. Involved in physical work - moving, lifting, carrying and placing merchandise and supplies. Maintaining accounts of sales made, new orders, cash transactions and customer details. Track and report inventory levels, and assist store managers with replenishment to meet and exceed sales goals. 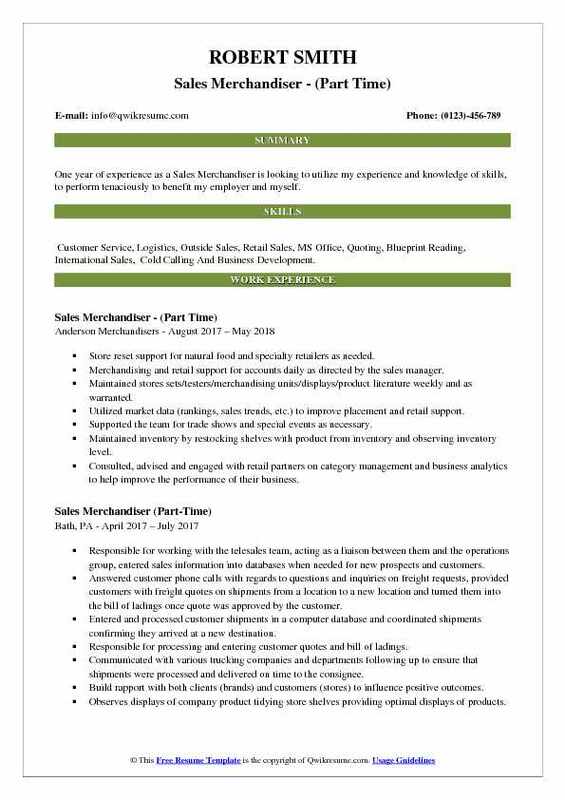 Headline : Retail Merchandising/Sales professional with 5+ years of experience, excels in fast-paced, deadline-driven environments. Client- focused with a broad knowledge of the clients needs. Outside/Inside sales experience. I have merchandising, planogram, inventory management, training, operations expertise. 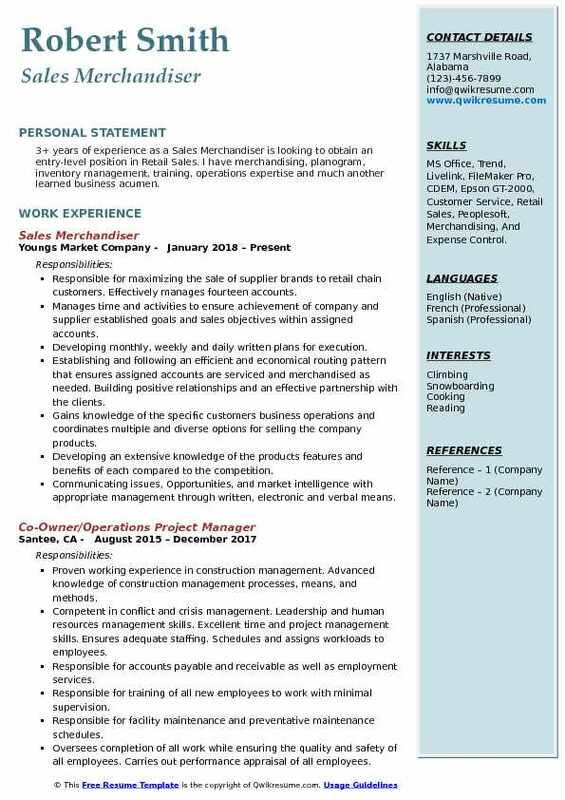 Skills : Inventory Management, Labor Management, Training & People Development, Account Management, Event Planning, New Store Opening, MS Office, Adobe, Sales, And Marketing. Executing merchandising strategies for 3 different companies in various retail venues including mass merchants Walmart, Sams Club, Target, Costco, Jewel-Osco, and Kroger. Responsible for merchandise replenishment and placement, planogram integrity, product rotation, pricing, reorders, modular resets, and pop displays and signage. Recognized for exceeding expectations, moving large quantities of product, achieving 6% increase for the year at American Greetings. Partnering with host store personnel to achieve and maintain merchandising excellence, building effective working relationships. Report and discuss observations and issues with district sales manager to drive sales and enhance product and process. Effectively executed assigned projects with quality and accuracy driving sales and promoting brand recognition. Helps field sales representatives with special promotions by setting up displays at aisle ends, checking daily on special. Headline : A motivated leader with years of experience in sales, marketing, sales management and merchandiser. Skilled in coordinating, motivating and training sales and support teams with positive results. Creative team player with the ability to make and communicate decisions. 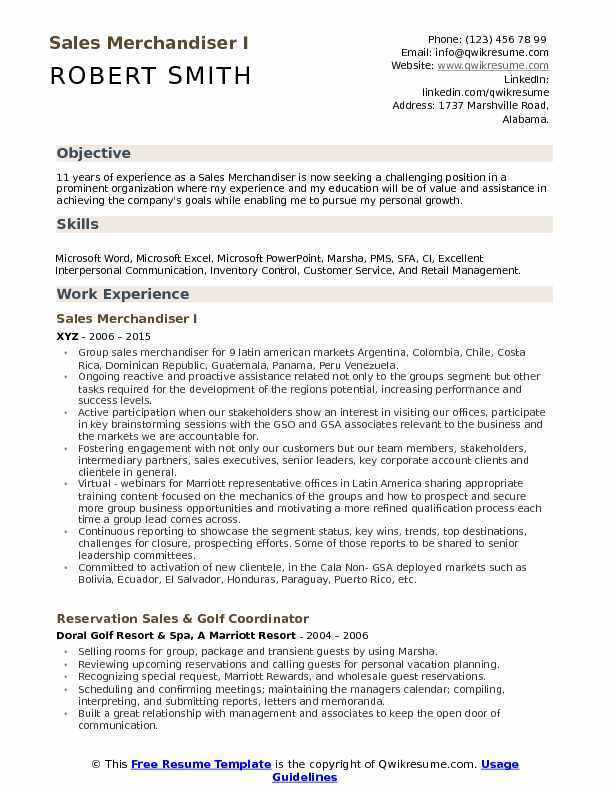 Skills : Inventory Management, Sales, B2B, Scanning, Customer Service, Photoshop, Photography, Office Applications, MS Office, Interpersonal Skills, Excellent Communication. Daily resolution of all client problems/issues via direct communication with client management. Document all merchandising issues via data input into a handheld computer. Present promotions to client management to increase their future sales. Conduct daily follow up with off-site supervisor concerning any client discrepancies. Ensure POS relevance with client company goals and promotions via e-mail and handheld computer. Generate product promotion ideas to deliver on sales goals and equip store personnel to effectively represent new product lines or marketing strategies. Ensure accurate product placement and brand representation in major supermarket chain and big-box retailers. Build rapport with both clients (brands) and customers (stores) to influence positive outcomes. Summary : 11 years of Retail Sales experience as a Sales Merchandiser. Former business owner in large and small format accounts. Ability to anticipate customers needs with integrity while achieving customer and company goals. Described by customers and co-workers as accessible, dedicated, loyal, and provides excellent customer service. 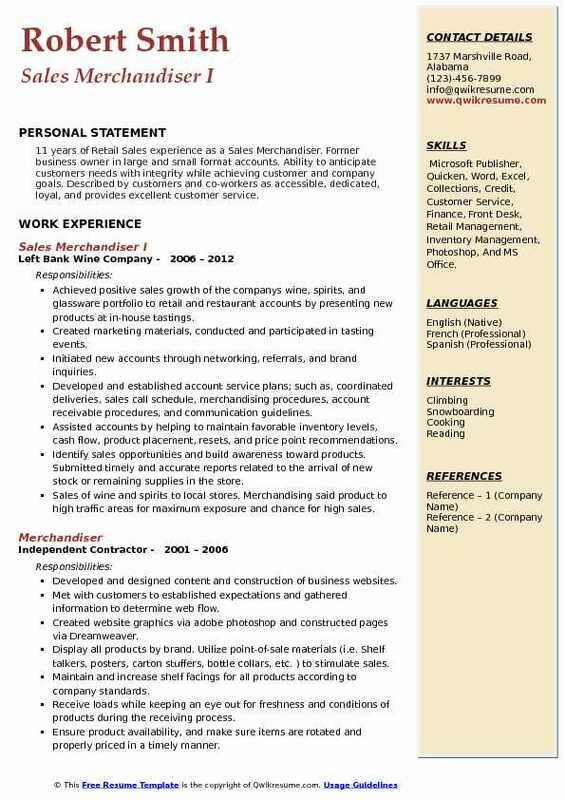 Skills : Microsoft Publisher, Quicken, Word, Excel, Collections, Credit, Customer Service, Finance, Front Desk, Retail Management, Inventory Management, Photoshop, And MS Office. Achieved positive sales growth of the company's wine, spirits, and glassware portfolio to retail and restaurant accounts by presenting new products at in-house tastings. Created marketing materials, conducted and participated in tasting events. Initiated new accounts through networking, referrals, and brand inquiries. Developed and established account service plans; such as, coordinated deliveries, sales call schedule, merchandising procedures, account receivable procedures, and communication guidelines. Assisted accounts by helping to maintain favorable inventory levels, cash flow, product placement, resets, and price point recommendations. Identify sales opportunities and build awareness toward products. Submitted timely and accurate reports related to the arrival of new stock or remaining supplies in the store. Sales of wine and spirits to local stores. Merchandising said product to high traffic areas for maximum exposure and chance for high sales. Headline : Energetic, deadline-driven professional with 6+ years of diverse experience as a Sales Merchandiser. Demonstrated success in launching, executing, and managing consumer programs, promotions, and brand initiatives. Builds trust and meaningful relationships with internal departments at all levels and external clients and vendors that result in long-term partnerships, profitability, and organizational growth. Skills : Microsoft Office, Adobe, Photoshop, Outsourcing, Administrative Assistant, Documentation, Retail Management, File Management, And Project Management. Managing product inventory for 30 retail locations ensuring proper rotation and freshness. Maximizing sales and increase sales volume for manufacturer and retailer accomplished through retail execution, liaising with the rep, marketing promotion, and sales reporting. Collaborating with department managers to order sufficient product for store promotions. Building product displays to maximize sales during store promotions; ensure proper signage and favorable shelf placement. Draft sales contracts and review the demographics of the retail store to ensure that the correct amount of stock is ordered and provided. Monitoring inventory levels versus sales to determine how much more product needs to be ordered. New item placement, void corrections or special merchandising activity for a specific aspect location. Stock rotation, building displays, completing surveys audits, we also execute product.